One of the first things to think about when creating a brochure is how it will fold. Making a plain paper folding dummy can help you determine accurate sizes for the panels. A few of the more common folds are roll fold, accordion fold and gate fold. The panel sizes are determined by the fold you want to use. An accordion fold is one of the easiest because all of the panels are the same size because of the zig-zag. The roll and gate folds fold in on each other. To make the brochure as flat as possible some panels must be shorter. How much shorter depends on the stock to be used for your project. In the following example we will build an 8.5"x14" document and show you the sizes for each of the panels. Roll Fold consists of three or more panels that roll in on each other from the right. A three-panel roll fold is often called a letterfold. Accordion Fold consists of three or more panels that zig-zag back and forth. 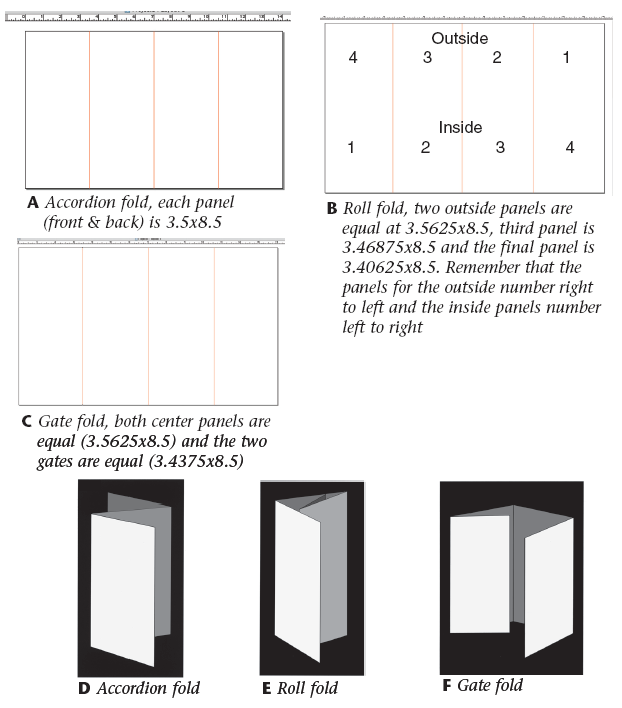 Gate Fold is a symmetrical fold consisting of two opposing fold-in panels.